Gulf Bay® Group of Companies (Gulf Bay) announces that infrastructure and site development activities are now underway at Mystique, the new ultra-luxury high-rise in the exclusive Pelican Bay community in Naples. The initial construction at Mystique – located on one of only two remaining developable land parcels in Naples between The Ritz-Carlton on the beach and Port Royal – includes subsurface preparation for the structural foundation of the iconic tower, with clearing, grading of the land and connection of underground utilities. Mystique will introduce modern architectural influences to Pelican Bay’s Gulf-front skyline – along with a new level of ultra-luxury living. 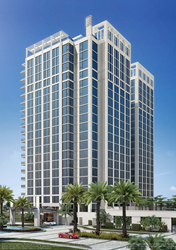 The high-rise features 68 estate and four penthouse residences showcasing views toward the Gulf of Mexico from most units. Mystique also offers nine Jardin residences. Estate residences at Mystique range in size from 4,003 to 5,280 square feet of air-conditioned living space and are priced from over $3 million to over $7 million. Penthouses range from 4,579 to 5,704 square feet under air and are priced to $10 million. Jardin residences range from 1,366 to 2,401 air-conditioned square feet and are priced from $1.2 to $2.2 million. Mystique’s resort-inspired outdoor recreational amenities include a tropical pool, sun deck with pergolas and lush landscaping, and two Har-Tru tennis courts above the garage deck. Mystique’s elegant lobby-level amenities include custom-designed interior spaces for socializing, including a club room, parlor, salon, library and solarium/card room. Mystique also offers a theater, billiard room, library, board room, state-of-the-art health club, ladies’ and men’s steam rooms and showers, and massage rooms with on-call masseurs and masseuses. Residents also will enjoy the many opportunities at Pelican Bay, including private, beachfront dining, extensive walking and biking trails, chauffeured tram service, and private access to nearly three miles of unspoiled Gulf of Mexico beaches. Premier Sotheby’s International Realty is serving as the exclusive listing agent for Mystique, based out of the sleek and contemporary on-site sales center. Reflecting the modern architectural style of the ultra-luxury high-rise, the sales center showcases several features of Mystique’s sophisticated and refined design, including luxury kitchen and bath vignettes. Reservations for Mystique are underway. The developer for Mystique is Pelican 1 Owner, LLC, an equal partnership between an affiliate of the global investment firm Kohlberg Kravis Roberts & Co. (KKR) and an affiliate of the Gulf Bay Group of Companies. Founded in 1986, The Gulf Bay Group of Companies, has successfully completed 14 luxury properties along a 1.5-mile stretch of Gulf-front land within Pelican Bay. In addition to its history in Pelican Bay, Gulf Bay’s other award-winning developments include The Brittany on Park Shore Beach; Marco Beach Ocean Resort® on Marco Island; and the 4,000-acre award-winning, master-planned community of Fiddler’s Creek®. The Gulf Bay Group of Companies’ estimated, completed and under development build-out market value of luxury residential properties is in excess of $5 billion. KKR is a leading global investment firm that manages investments across multiple asset classes. KKR had $131 billion in assets under management as of June 30, 2016. For more information about Mystique, call 239-598-9900, stop by the sales center at 6885 Pelican Bay Blvd., or visit http://www.MystiquePelicanBay.com.